Clocking in at under an hour and a half, Skybound really is a low risk audibook to try. Now, with that pitch out of the way, Skybound is one of the BEST audiobooks I’ve heard to date. When I originally read the ebook, I couldn’t believe HOW MUCH could be gloriously packed in 44 pages, Listening to the audiobook, I found myself in that same place…I couldn’t believe HOW MUCH could be gloriously packed in 1 hour and 25 mins. I’m a part of a book club that has been friends for almost 3 years now. Skybound was one of those gems that we all read and loved together…that we raved about. So when Aleksandr Voinov announced he was releasing it in audio, we jumped on board to do a ‘reread’. WHAT A TREAT. Matthew Lloyd Davies narration was flawless. It’s my first audiobook by a “non-American” narrator, and I wondered how I’d take to the accent. Davies voice is like butter…smooth and soothing. And as I listened, I felt swept away into the scenes of the story, yet shielded from the war that set the stage. I was enraptured in the deep affection between Felix and Baldur, but reminded of the time and place of their forbidden relationship. Between Voinov’s writing and Davies’ narration, I was so caught up in every emotion…I felt it all deeply. If you haven’t read the book or listened to the audio, this is one that I would highly suggest doing both. It’s a love worth knowing over and over again. If I could describe how really amazing this is, I’ll leave you with this: our bookclub, after listening to the audiobook, got together to discuss (virtually). I would leave you with notes from the discussion, but it basically went like this, “I loved it!” “OMG, so did I!” “Did you love it?” “I did! I’ve listened to it 3 times already!” “I didn’t know I could love the story any more than I already did!” “Don’t you just love it enough to go back and listen again?” …and there you have it. We loved it. 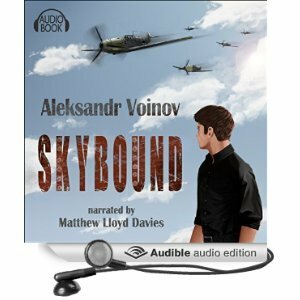 This entry was posted on October 12, 2015 by susan in Historical, Reviewer: Susan and tagged 5 Stars, aleksandr voinov, audiobook, book club, matthew lloyd davies.